I am a complete and total sucker for birthday parties. Growing up, my mom always went above above and beyond to make sure that our birthdays were nothing short of magical for my brother and I. 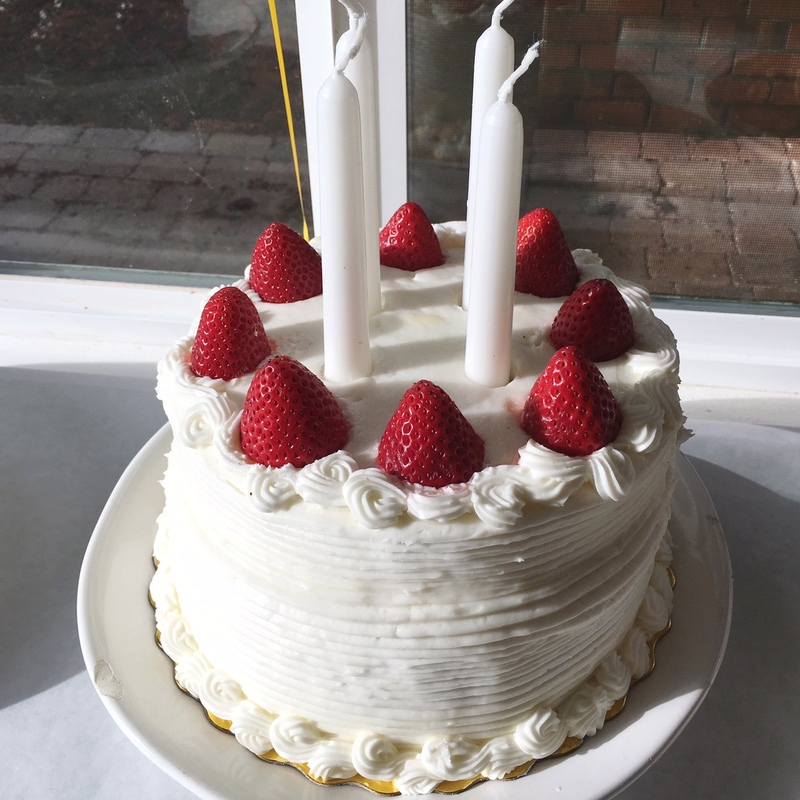 She wasn’t the craftiest or a natural hostess and she was never much of a baker, but she always found ways to speak our love language on our special day, and even during years when there wasn’t much money to spare, she found little ways to make magic. 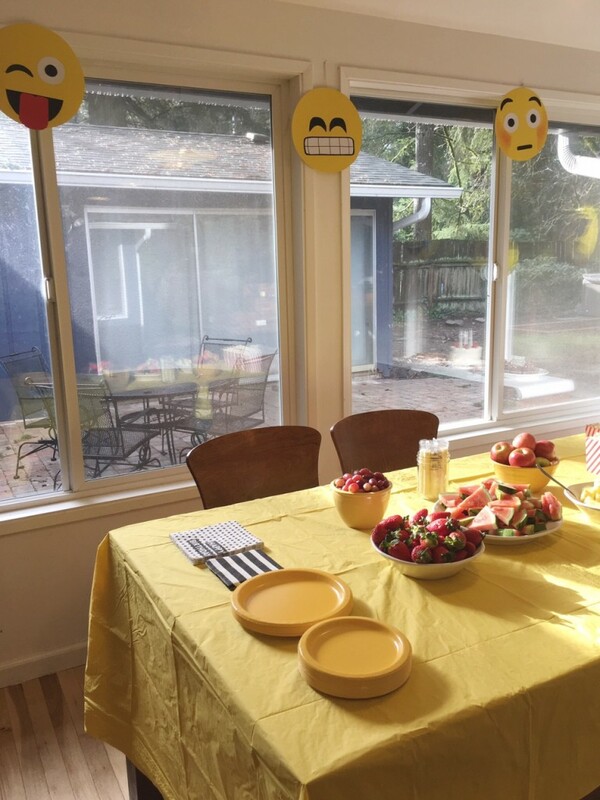 I’m a firm believer that you don’t have to go nuts creating something super over-the-top and “Pinterest-y” when it comes to birthdays, but if you enjoy it and you have a kid that will appreciate it, then why not? Last year I think I may have gone a “bit” (OK, probably more than a bit) overboard with her ballerina birthday party and as much as I know Fern truly does notice and appreciate the little details of a good party, I did try to keep things much simpler this year. A few weeks before her birthday, I let her peruse my “events” board on Pinterest to get some ideas for what kind of party she wanted. I was desperately hoping to steer her away from a princess party (although I did put together a pretty sweet Tangled party for her last summer, so I know it doesn’t have to be super tacky) and was optimistic that Pinterest would help her choose something more interesting. 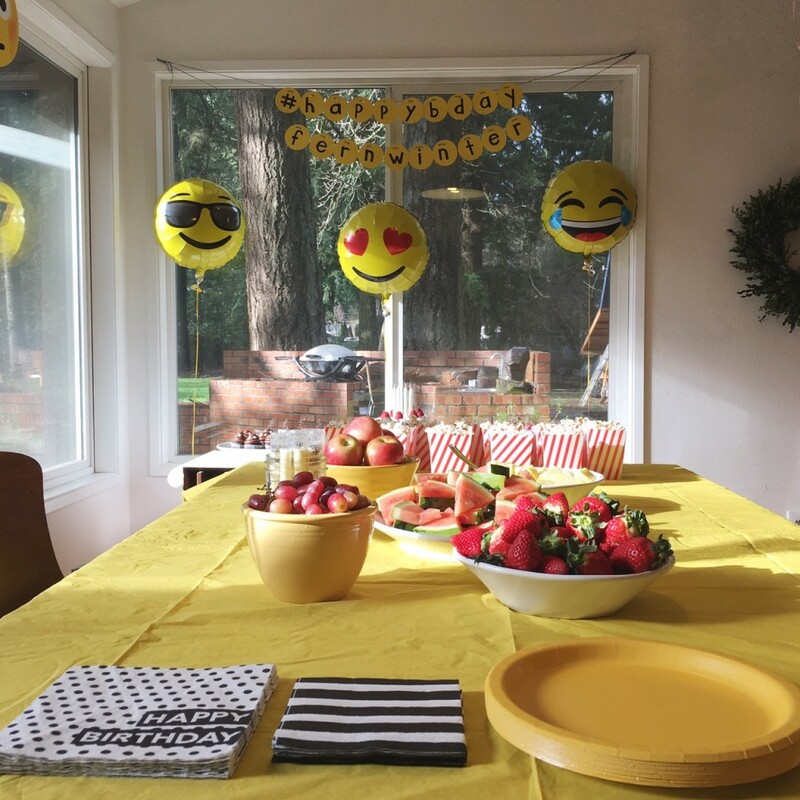 She stumbled upon a DIY for emoji balloons that I had pinned awhile back and knew instantly that an emoji birthday party was exactly what her little heart desired. She loves emojis and is constantly asking to send “kid messages” (i.e. her term for emoji filled text messages) to our friends so it was a perfect fit. 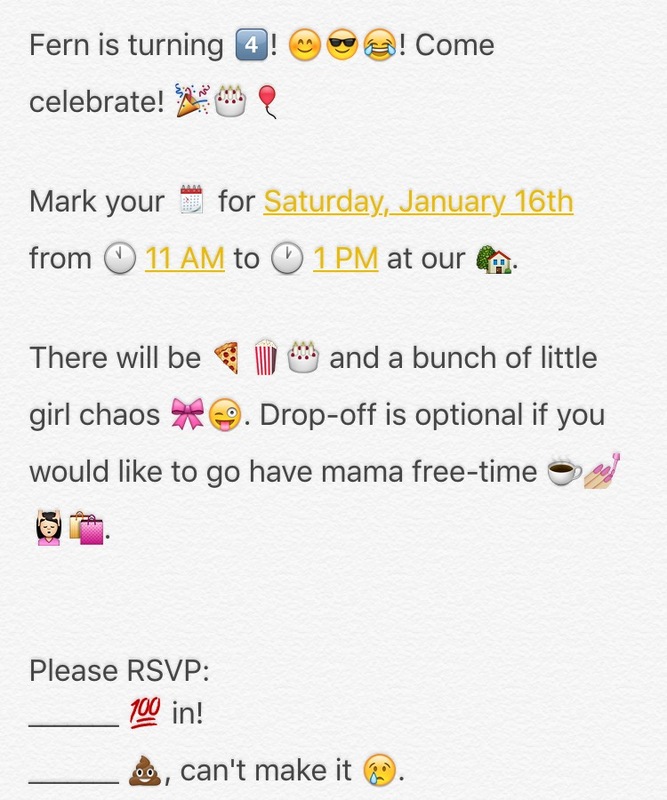 I started by making and sending out the easiest invitations ever…and by “making” I mean I typed this out really quickly in a note on my phone, took a screenshot, cropped it and texted it to the mamas of Fern’s friends. I love the idea of mailing actual invites, but ain’t nobody got time for that. Plus, this conveniently went with our theme. Done and done. When it came to decorations, I tried to keep things pretty simple where DIYs were concerned, because I knew I wasn’t going to have the time or energy to take on too many extras. 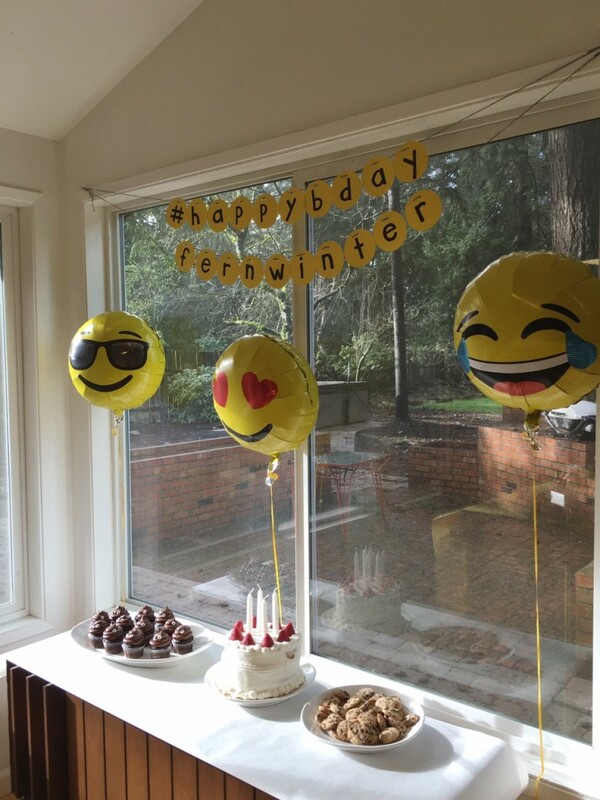 I bought a couple of pieces of poster board in black, white and yellow to make a #happybdayfernwinter banner and a couple of big emoji faces (see next photo). I just traced round objects for the faces and eyes and free-handed the rest. It actually didn’t take nearly as long as I had anticipated, but I definitely stuck with the easier to draw emojis. I was originally going to DIY some mylar emoji balloons, but a party store near us had actually just started carrying emoji balloons! Best luck ever! There weren’t a ton of options, but our favorites were covered. I always like to make my food spread do double duty by stepping in as party decor when possible. Last year for Fern’s ballerina birthday party, a lot of the food was pink to coordinate with the pink ballerina theme (think: pink lemonade, strawberry yogurt covered raisins, etc…). This year I went the obvious route of making all the foods “emoji foods”. There are definitely a lot of sweet treats and junk foods when it comes to emojis (and barely any veggies! ), but I think we ended up with some fairly well-rounded options all things considered. Grapes, strawberries, watermelon, pineapple, apples, cheese (OK string cheese was a stretch, but I needed more protein! 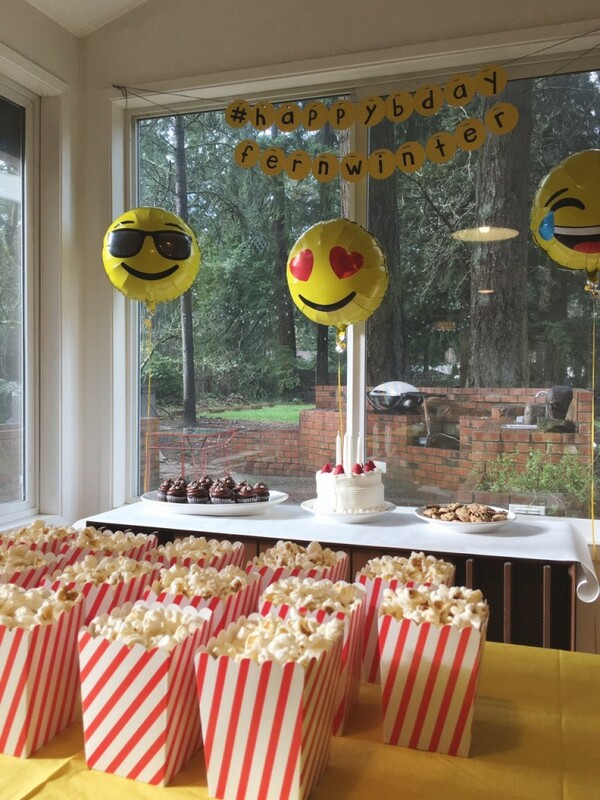 ), popcorn, emoji-poop chocolate cupcakes, birthday cake, chocolate chip cookies and pizza. 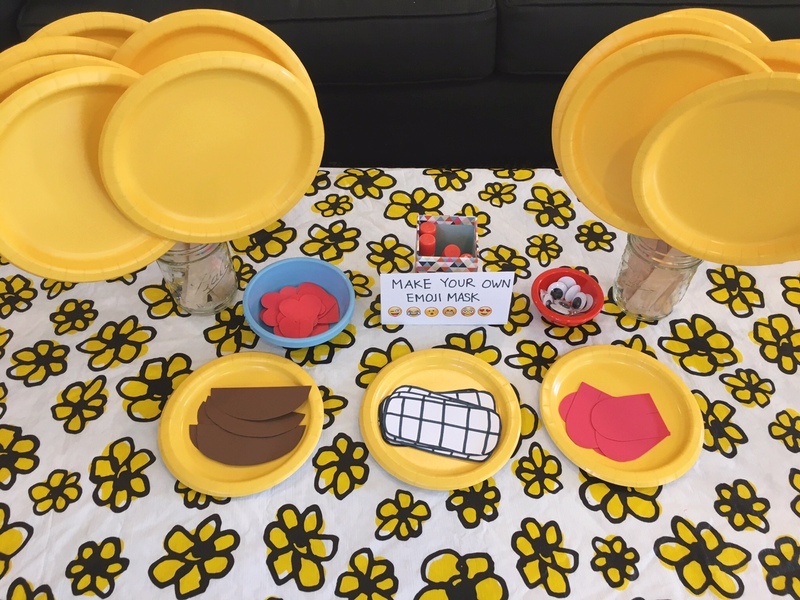 I made the pizza double as an activity for the kids by setting up a “make your own emoji pizza” station. Not only did this keep the kids occupied for a bit, but it saved me the work of making them myself! 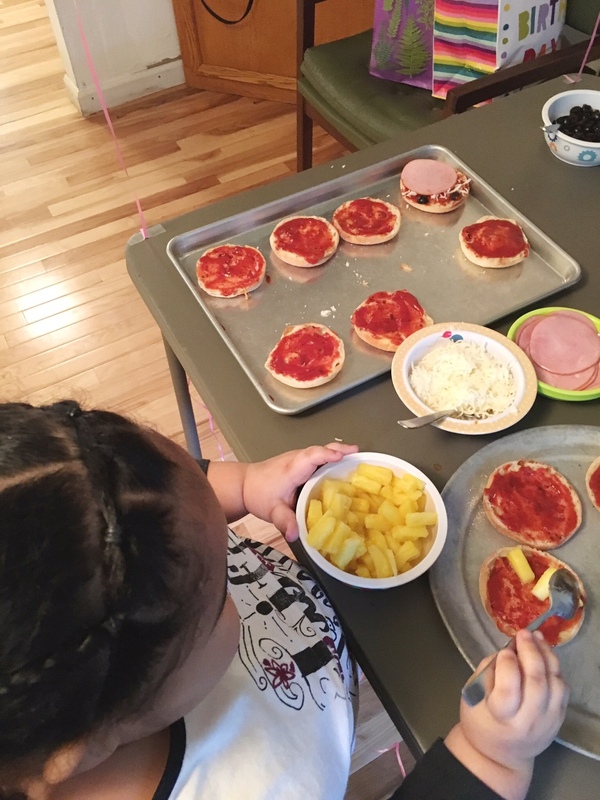 We just used english muffins and store bought pizza sauce and I set out little bowls filled with toppings: cheese, olives, pineapple, Canadian bacon and pepperoni. I didn’t bother with veggies, because I wanted to keep it simple and figured they wouldn’t get touched anyway. The emoji birthday cake (it looks just like the actual emoji!) 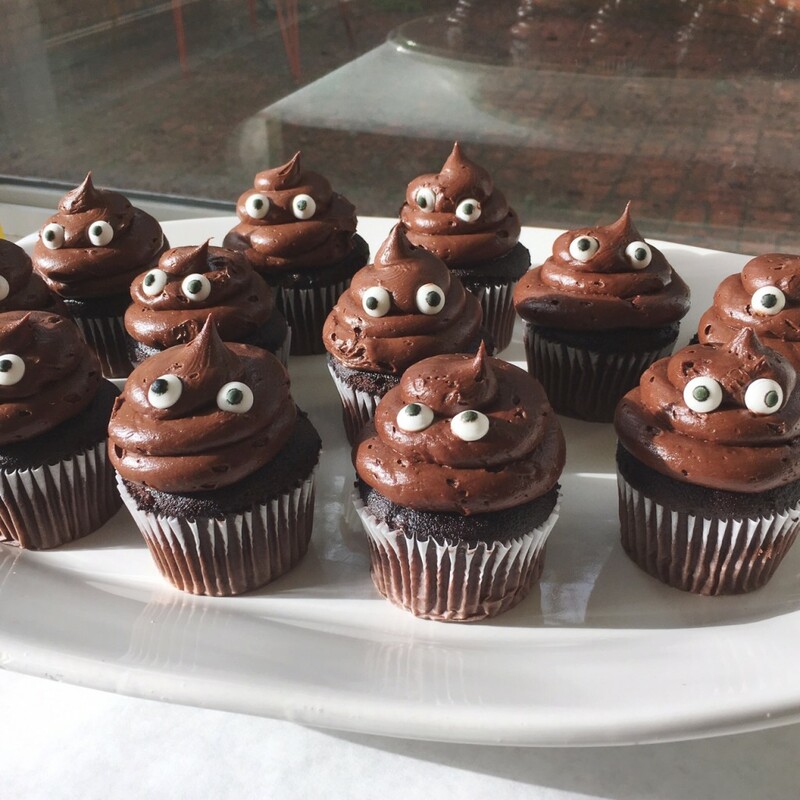 and the emoji poop chocolate cupcakes were my favorite thing about this party and the very best part was that I didn’t even have to make them myself! For just $24, Safeway made this awesome 3-layer cake and a dozen cupcakes. I didn’t have to stress about baking and it was actually less expensive than making it myself since I was lacking a lot of the baking tools I needed. Seriously: best mom hack ever. God bless grocery store bakeries. I kept the activities to a minimum, because in my experience, kids at this age don’t really care about them anyway. A few will be super into them, but mostly the kids always just end up running off to Fern’s room to play dress-up or wreak general havoc, so I figured why fight it? I did want there to be a couple of simple activities for the kids who would enjoy them though, as well as to keep things moving if there was a lull. 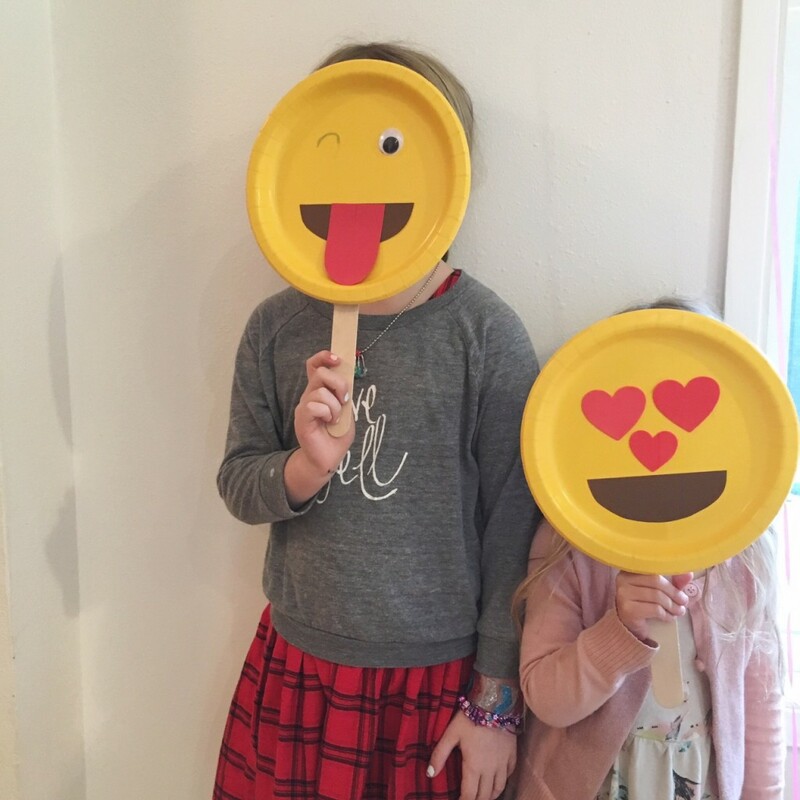 I set up a “make your own emoji mask” station, but kept it really simple. There were a ton of facial features I could’ve DIY’d, but I kept things basic. 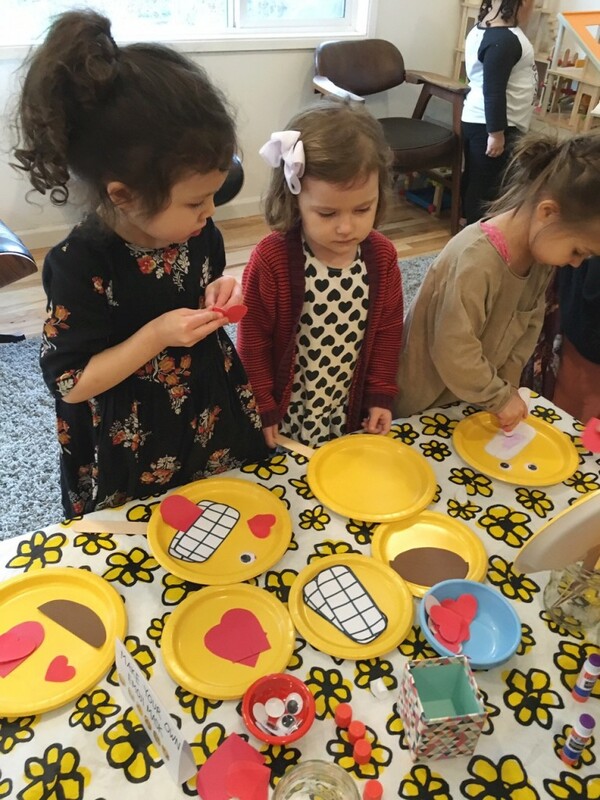 I taped yellow disposable plates to large wooden craft sticks for the masks and then had little bowls out that were filled with peel and stick hearts, googly eyes and a few construction paper mouth options. They actually turned out to be pretty cute! 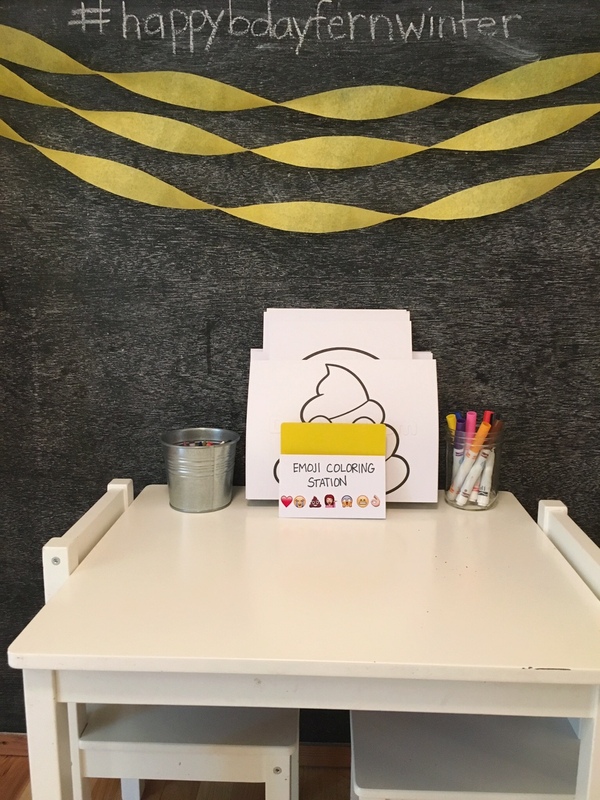 I also set up an emoji coloring station. I just printed off a bunch of emoji coloring sheets I found online (just google emoji coloring sheets) and put out some crayons and markers. I’ve found that coloring or drawing is always a nice option for the kids who are a bit more introverted. Gives them a place to escape for a bit if they start feeling too overwhelmed. 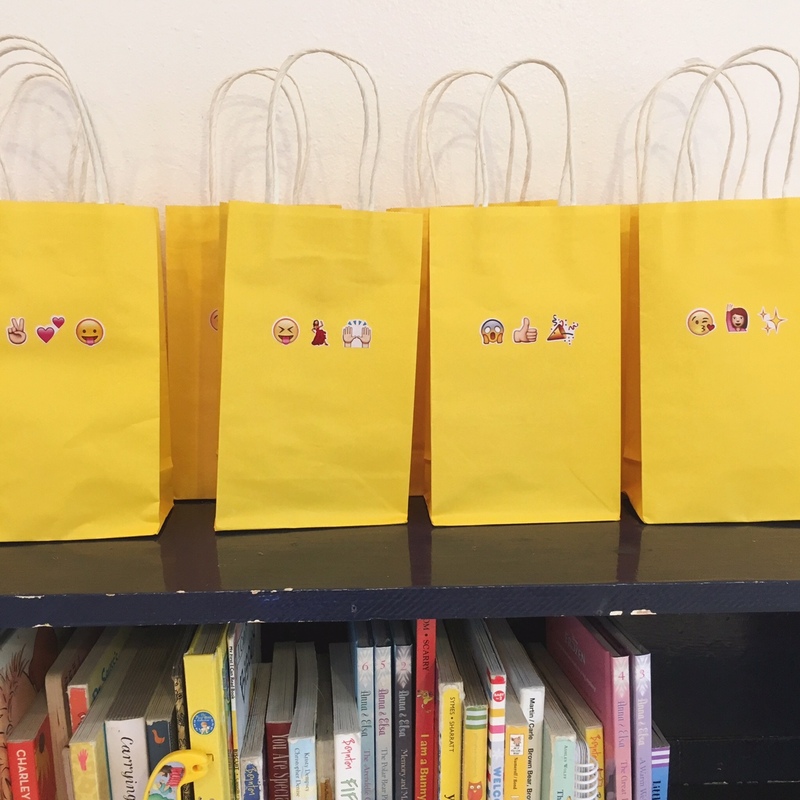 For the goody bags, I just bought a bunch of yellow gift bags from the dollar store (they come in 3 packs) and stuck a few emoji stickers on them. Inside the bags were bubbles, playdough, some emoji stickers and a few other small trinkets I hoped wouldn’t be too terribly annoying. Goody bags are sort of a pain most times, so I try to fill them with things that are actually fun and not just cheap junk that will get chucked once they get home. Also, no candy! Birthday parties already have enough sweets! I was really happy with how everything turned out. 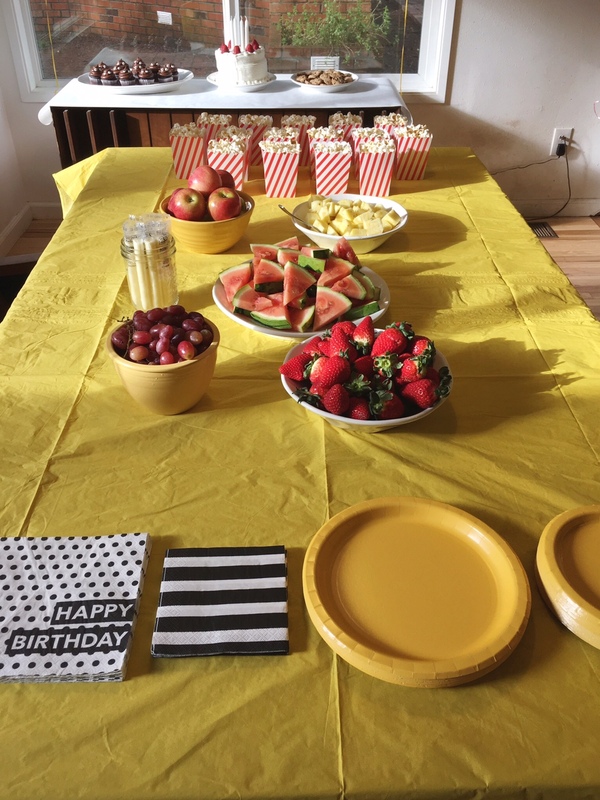 The theme was fun, but it wasn’t super overwhelming and I was able to keep things relatively simple, but most importantly, Fern had a blast celebrating with her friends. 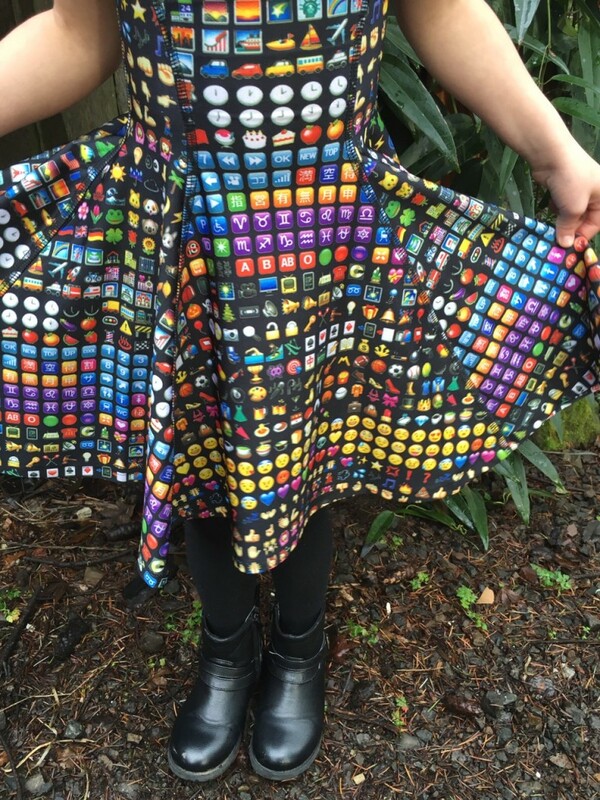 Im pretty sure Fern’s favorite part about her emoji-themed birthday party was her awesome emoji dress we got from Zara Terez. It didn’t end up arriving in time for her birthday, but Fern didn’t care in the slightest. She was thrilled when it arrived at our doorstep and put it on immediately. 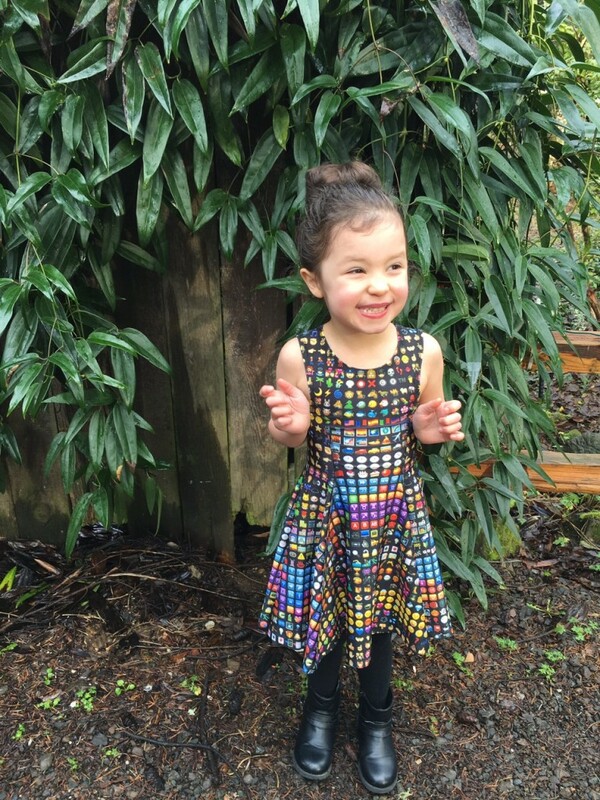 It has quickly become the most beloved dress in her closet (she wore it four days in a row when it first arrived! 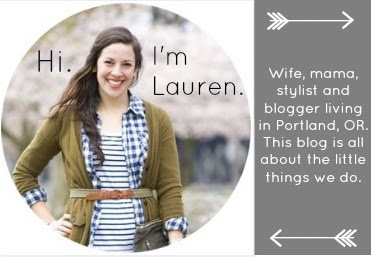 ), because it combines some of her most favorite things in life: emojis and twirling. 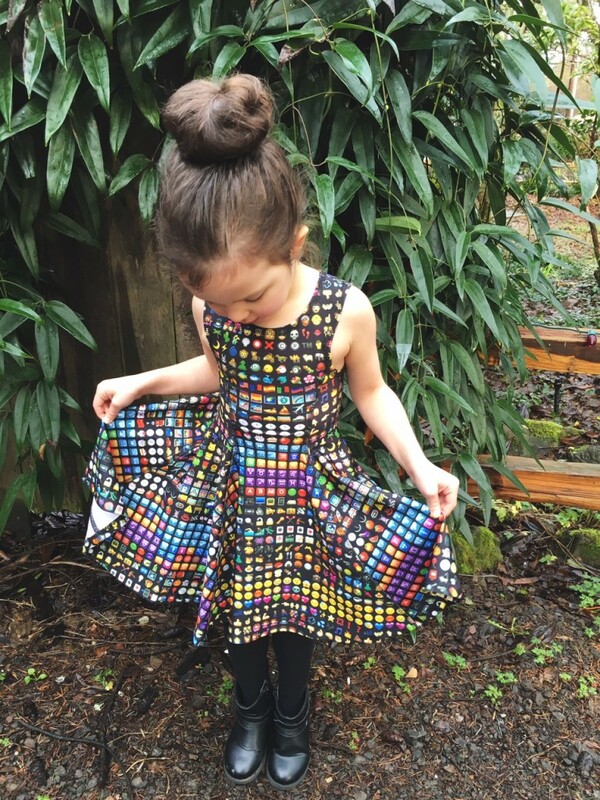 The twirl factor of this dress is on point. 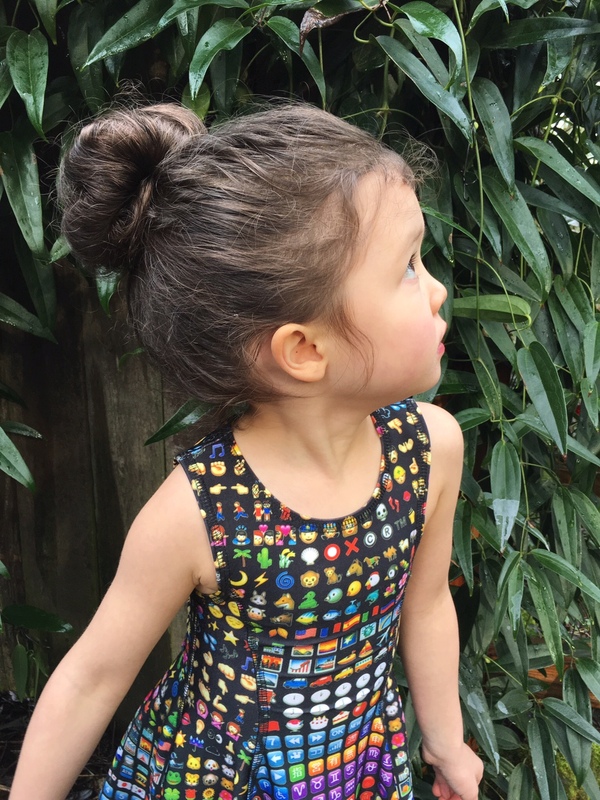 If you have an emoji-obsessed little one (or are just emoji-obsessed yourself! ), here is the link to the dress, and Zara Terez has kindly offered 25% off anything on their site for my readers using the code: lauren25. *Note about the fit of the dress – I would suggest sizing up. Fern weighs 37 pounds and it pretty tall so I got her a size 5. Usually size 5 runs slightly big on her, but this fits perfectly. I probably could’ve sized up to a 6 though if I wanted to give her growing room, because the material is really stretchy (like a thick swimsuit almost). 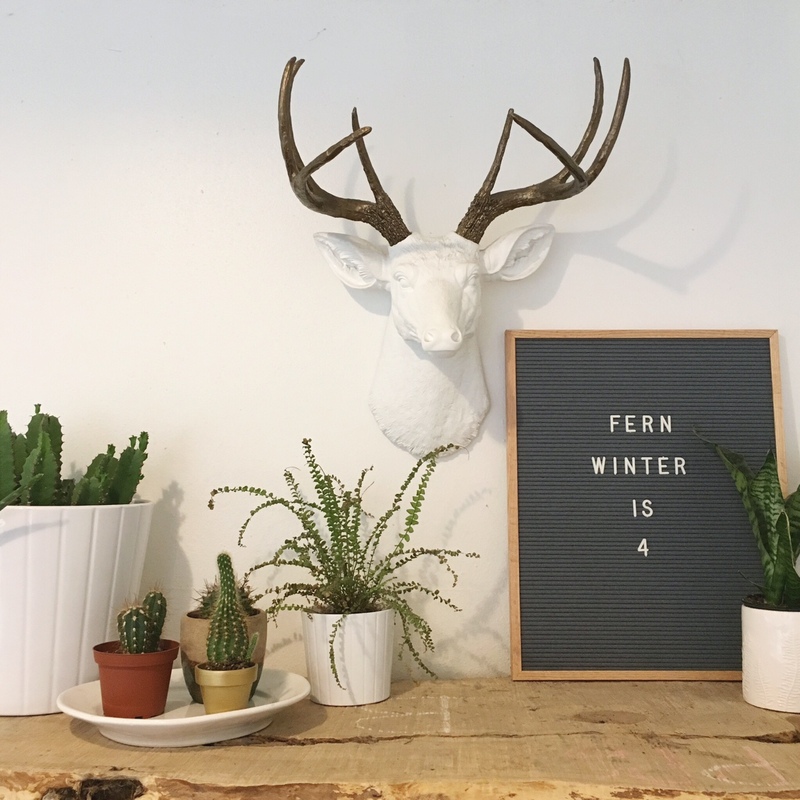 Happy birthday to our sweet Fern Winter! I can’t believe you’re 4!